After suppressing her grief all through her triumphs and tribulations as a Grey Warden, and eventual Warden-Commander, Minerva Cousland finds comfort in the most unlikely of places. (Warning of Major Character Death for the mentions of a certain character's death). A thrilling tale of a woman who longs to be free from the confines of the prisons she has built around herself, and a man whose sole desire is to destroy the person who he believes destroyed his family. As the threat of the Chasind lead by a strange and powerful Avvar mage knock at their southern doorstep, the two must work together to survive in both the wilds and amongst the nobility. One finds redemption, the other finds forgiveness and their fates soon intertwine as they face adversity in every imaginable form that seeks to separate them. Nathaniel laments over his lover. Nathaniel lounged on the bench where Elissa usually sat. A wave of irritation flared within her at finding him in the spot she came to feel as hers. It receded just as quickly. Vigil's Keep was his home, after all, and had been long before King Alistair gifted it to the Grey Wardens. The Vigil, and all of the Arling, had belonged to the the Howe family for generations. She decided to retreat to the main hall. Despite his numerous apologies, his angry words, when she found him in a cell, cut like a knife against a half-healed wound. The hatred in his expression, matched Alistair's when she spared Loghain. She'd thought Vigil's Keep would be a haven, an escape from the cold disdain she now received from the king. Instead, she lived with her biggest regret. Rhaydyn Cousland was the new Grey Warden Commander in Ferelden, after helping to defeat the Archdemon in Denerim. 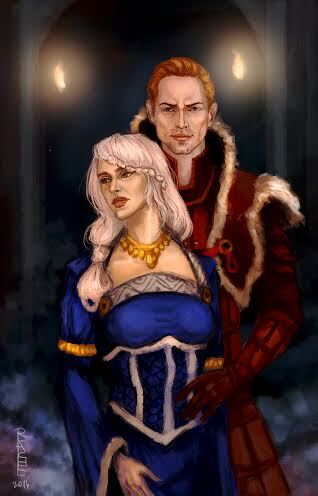 Alistair and Leliana had gone off together, lusty and in love. Morrigan had disappeared after her dark ritual. Zevran had gone back into hiding from the Crows. The Queen of Ferelden gifted Rhaydyn with the Arling that had belonged to the man who had murdered her family. Her brother had taken up the mantle of Teryn Cousland, and Rhaydyn was left alone to pick up the pieces of her life. Nathaniel Howe is the eldest son of Rendon Howe, the man who had the Couslands murdered in their own home. When he first got news of his father's death, he had plotted a special kind of revenge for the faceless Hero of Ferelden. Until he heard about who she was. And what his father had supposedly done. When she conscripted him into the Grey Wardens... Maybe it wasn't a death sentence after all. Maybe it was a ticket to a new life. Love. Maybe even forever. Once betrothed, now Nathaniel is shocked to learn that this woman is the one who killed his father. Is it nostalgia that stays his hand or are these feelings still real? Growing up, Emilia Cousland always had a crush on her older brother's best friend: Nathaniel Howe. But she was never able to tell him due to a number of unfortunate events - all caused by Nathaniel's father. After Emilia became a Grey Warden and ended the Blight, the pair is finally reunited - albeit not under the best circumstances. In an alternate setting of Dragon Age: Origins, Emilia Cousland and Nathaniel Howe spend their entire lives knowing one thing is for sure: one day, they will marry. Childhood friends turn to lovers, but before their big day arrives, Nathaniel's father Rendon commits a great treachery against the Couslands, unbeknownst to Nathaniel. Forced to survive on the run and on her own, Emilia finds a few companions she is able to trust. Meanwhile Nathaniel, refusing to accept the false news of her death, attempts to find his lost love. A fairytale ending tainted by infertility and an affair: the jaded Queen of Ferelden returns to her role as Warden Commander, fleeing her husband's side out of shame. Her search for a cure to the sickness in her blood brings her to Skyhold. quentin goes to speak with the prisoner in the dungeon in vigil's keep, bringing along another warden, talia cousland. when they discover their prisoner is none other than nathaniel howe, talia find herself in a position to either help or condemn the son of the man who betrayed her family. Part 18 of What Can 8 Grey Wardens Do? Nathaniel's tried to ignore his morbid curiosity but he simply can't do it anymore. He needs to know if there are any truth to the rumors about how his father died and, if not, what really happened. He won't like what he hears but he needs to know. While wandering the Fade, Nathaniel and Anastasia come across the spirit of his deceased father.